If losing weight and maintaining a healthy weight are your goals, then you should add as many veggies to your diet as possible. You can eat them in many different forms – from raw to juiced – making them an easy add to your daily diet. Many of the most common veggies are considered “superfoods” and can also increase your health and wellness while helping you lose weight. 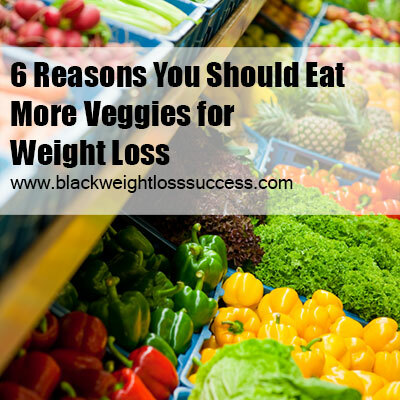 Here are 6 other reasons why you should eat more veggies to help reach your weight loss goals, and keep the weight off. Veggies are some of the lowest calorie foods around, which is one of the reasons why you can overindulge if you like, compared to eating a ton of donuts. As long as you are mindful that you aren’t ruining your calorie count goals with high calorie dips and sauces, you will have found the super snack food that tastes greats, makes you feel full and doesn’t pack on the pounds. Veggies are packed with fiber; it is what forms the shell that protects the interior where the vegetable nutrients are. This is good for you as your body not only needs fiber in order to digest those nutrients. The fiber also helps keep you feeling full. Make veggies your go-to snack when you are hungry and between meals and it will be easier to control your portion intake. Cooked, canned or raw veggies remain the best choice for your vitamins and nutrients each day. Don’t be fooled into thinking that just taking supplements can provide you with what several servings of veggies can. These are natural sources of what our very natural bodies need to be healthy. The body loves nutrients from real food sources (unless you have an allergy or medical issue that inhibits you from eating veggies, of course). No synthetic substitute will do as much for you as the real thing. One great trick to get into the habit of eating more veggies and less negative foods is to begin to replace some of your negative foods with portions of vegetables. Have your fast food fries, but have half of the normal serving and replace that half with a serving of sliced carrots instead. Slowly begin to replace the fast and fried foods with vegetables. Many times we are drawn to the negative foods because they are easy to come by and we like the taste. If you make reaching for veggies as easy, that takes care of one issue. If you also start to make eating veggies a part of your negative meals, the veggies themselves will start to take on the association of a treat – and that takes care of the other issue. Eat too much pasta and you will fill full and tired. Eat too much meat and chances are you will feel bloated and heavy. Eat too much dessert and you can just watch your waistline expand. You can’t eat too large a portion of veggies. There are some, like cabbage, that can make you gassy but for the most part there is no harm to eating too much. If you have the urge to snack and much, make it veggies and you won’t have to worry about suffering later from any ill effects or guilt from having indulged. One of the hardest parts about sticking to a diet is the feeling that you are missing out on all of your favorite foods. It is this sense of denial that leads to cheating and why many diets recommend that you plan to have a cheat meal once a week. The more veggies you add to your diet the more variety you are going to introduce, this can help reduce the feeling of being trapped into eating the same foods every day and keep you on your diet longer. Don’t fall into the habit of only eating certain types of veggies but experiment and find the ones you like. Make those veggies a part of your treat and cheat meal and you will reach your goals even faster. Why Should You Choose Seasonal Produce?